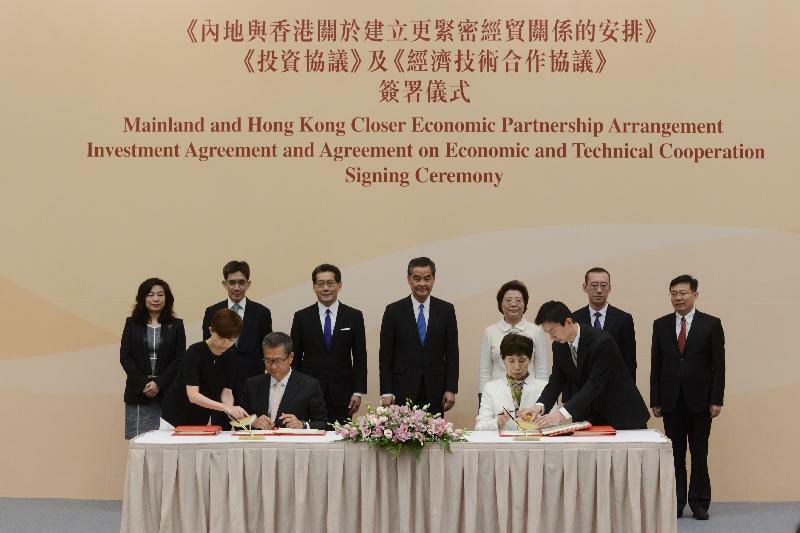 The Chief Executive, Mr C Y Leung, witnessed the signing of the Investment Agreement and Agreement on Economic and Technical Cooperation (Ecotech Agreement) by the Financial Secretary, Mr Paul Chan, and the Vice Minister of Commerce, Ms Gao Yan, today (June 28). 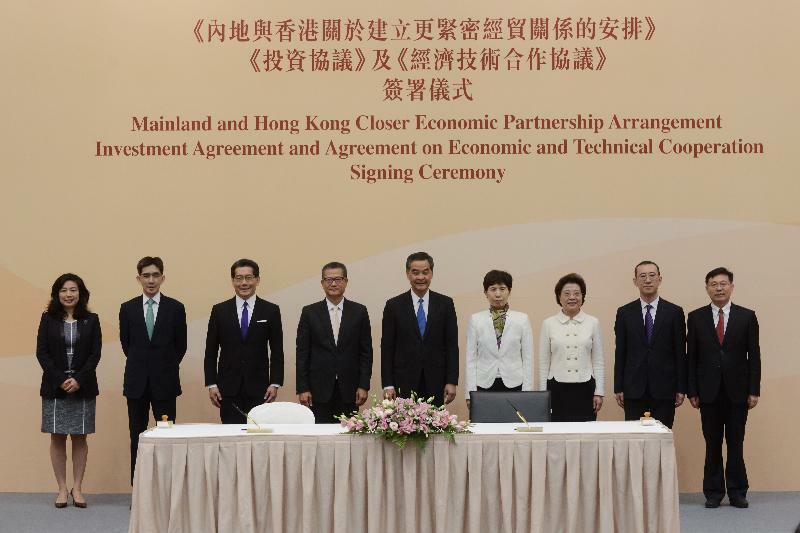 The Investment Agreement and Ecotech Agreement are new agreements signed between the Hong Kong Special Administrative Region Government and the Ministry of Commerce under the framework of the Mainland and Hong Kong Closer Economic Partnership Arrangement (CEPA). * The Agreement includes commitments of both sides with respect to substantive obligations on admission of investments. The Mainland commits to providing national treatment to Hong Kong investments and investors on par with Mainland investment and investors except for the 26 measures listed in the Agreement. Hong Kong can also enjoy more preferential investment access than other external investors in specific sectors. 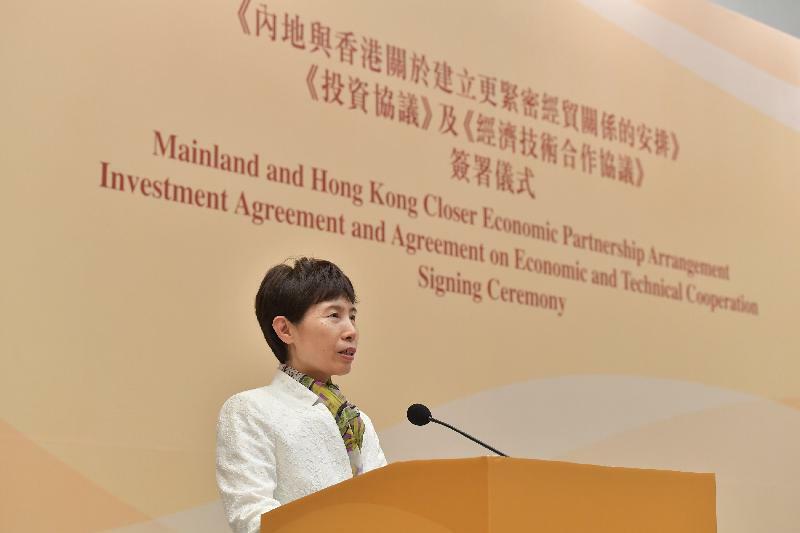 The Most-Favoured Treatment provision of the Agreement specifies that any preferential treatment the Mainland accords to investments and investors from other countries or regions will be extended to Hong Kong investments and investors. Since the commitments for admission of investments in services sectors have been covered under the Agreement on Trade in Services already implemented, the Investment Agreement will cover admission of investments outside the scope of the Agreement on Trade in Services (including manufacturing sectors, mining sectors and investment in assets, or collectively the “non-services sectors”). * The Agreement provides for commitments of both sides relating to protection and facilitation of investments, such as restriction on expropriation of investments, compensation for losses, and transfer abroad of investments and return etc. The Agreement also provides a mechanism for settlement of investment disputes arising from implementation of the substantive obligations of the Agreement by one side. The provisions on investment protection and facilitation under the Investment Agreement apply to investments in both services and non-services sectors. 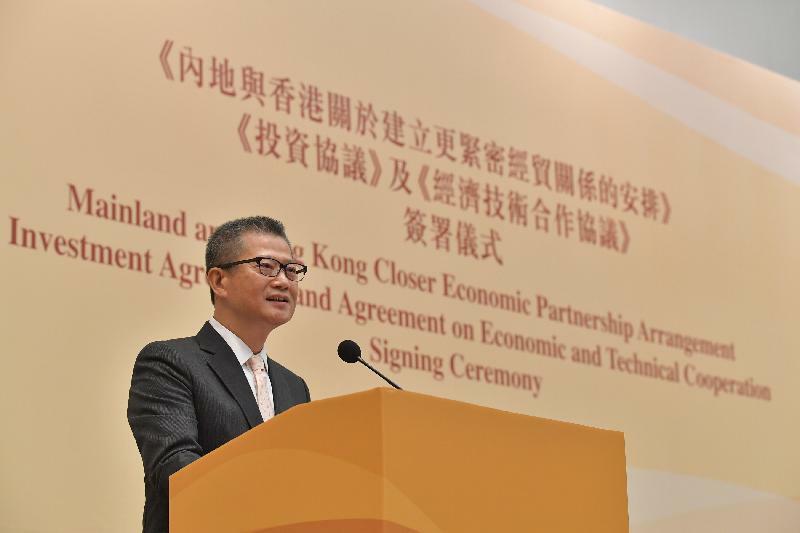 The Ecotech Agreement consolidates and updates the economic and technical cooperation activities set out in CEPA and its Supplements taking into account the development trends and needs of Hong Kong and the Mainland. It also strengthens the basis of and sets the direction for closer cooperation between the two places in future. The Agreement incorporates the cooperation in the economic and trade aspects of the “Belt and Road” Initiative and Sub-regional Cooperation into the framework of CEPA, thereby providing Hong Kong businesses with good opportunities for participation in the national development strategies. A summary of major cooperation activities in the Ecotech Agreement is at Annex. The Agreement came into force on the day of signing. The National 13th Five-Year Plan pronounced the stepping up of efforts to further open up the Mainland market to Hong Kong and enhancement of CEPA. The signing of the Investment Agreement and Ecotech Agreement represents the upgrading of CEPA to a modern and comprehensive free trade agreement, providing for the promotion and protection of the increasing investment flows between the two places with clarity and stability, as well as a vehicle for fostering economic and technical cooperation and exploring new areas of cooperation. With the two new Agreements, CEPA has broadened its scope to become a comprehensive modern free trade agreement covering four important pillars of trade in goods, trade in services, investment, and economic and technical cooperation. Hong Kong businesses can continue to enjoy the most preferential treatment in accessing the Mainland market. Details on CEPA can be found on the Trade and Industry Department website at www.tid.gov.hk/english/cepa/index.html.